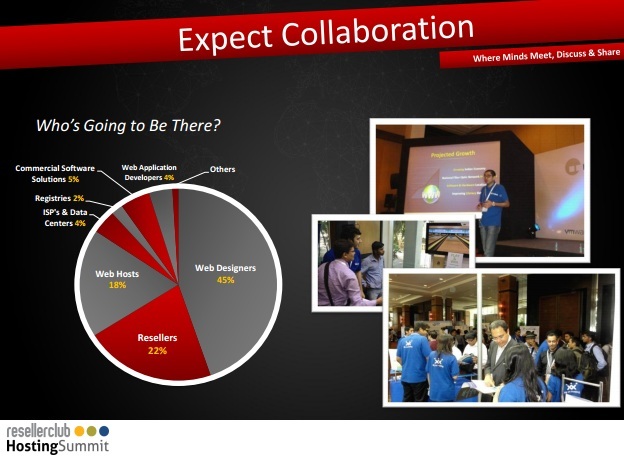 Indian web hosting provider ResellerClub announces the inaugural of its pioneering RC Hosting Summit, a dedicated conference for the web hosting community in India, on November 1st and 2nd in Mumbai, India. India is emerging in the web hosting market with an estimated projection of 16 million domains by 2016. The hosting market in India is continuously expanding at a very good rate. According to a research by Go Daddy, the customer base in India grew by 52 percent to reach 120,000 customers, since January. The conference is expected to feature more than 35 exhibitors on the exhibit floor. The conference content will further feature 12 sessions and 2 keynote presentations. It will try to cover trending topics with insights and experiences from industry veterans. Till now it is estimated to be attended by 2,000 indiviuals in the industry which will include web designers (estimated 45 percent), resellers (22 percent), web hosts (18 percent), ISPs and data center operators (4 percent), domain registries (2 percent), commercial software vendors (5 percent), and web application developers (4 percent). The conference is now offering four key sponsorship options in addition to multiple marketing options including event bags, planners, coffee mugs, coffee breaks, and lunch breaks. If you are interested in finding more details about The RC Hosting Summit, it is available in the event brochure. And if interested in attending the event, you may resister on their website. The RCHS after Hours Party is planning on offering chances for attendees to network with arrangements for cocktails and entertainment including musical performances, street magicians, and stand-up comedy. ResellerClub’s parent company, Directi Group appointed domain registrar ARI Registry Services as the exclusive registry services provider for its new entity Radix earlier in March. ResellerClub launched its reseller hosting services in February.